Present Owner: Musée de Saint-Pierre-Jolys Inc. 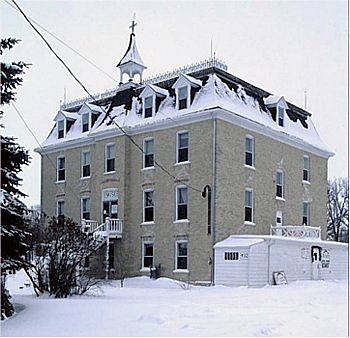 In the Manitoba Francophone community, the convent was second in importance only to the neighbouring church. Though serving as the home of various orders of nuns, the convent was usually designed as the chief educational facility in these small towns. The St. Pierre-Jolys convent is a well-preserved example of such a building, which has been a focus of community life since its erection in 1900. Joseph Azarie Sénécal (1841–1917) designed this structure and many other Roman Catholic buildings in Western Canada between 1892 and 1913. He was largely responsible for the spread and usage of the identifying elements of French-Catholic religious architecture—the mansard roof, the high central stair and boxy massing. This building remains a visible symbol of the survival of the unique Franco-Manitoban culture.